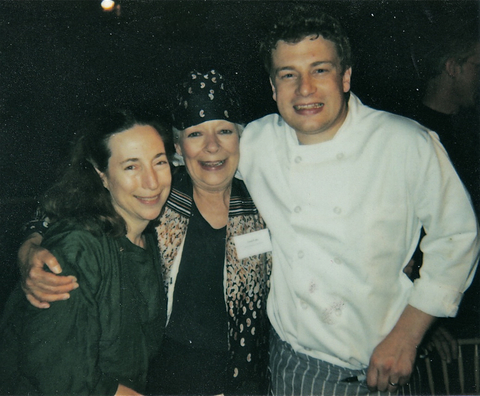 I'm talking about the big one on the right--namely Jamie Oliver! My darling friend Diane Boate, also pictured, is a local celebrity in San Francisco where this picture was taken several years ago. Jamie was doing a special event for All Clad in a large tent behind the Ferry Building and Diane and I arrived early. We decided to walk over to Ferry Crossings to get a copy of Diane's latest wine article and whom should we spy behind the tent but Jamie Oliver. We rushed over to introduce ourselves and he couldn't have been more charming. I was reminded of this when I ran into him again a few months ago in New York at the South Beach Festival book party. He was standing behind me in line to be photographed by the group of paparazzi. Since I hadn't bothered to read all the information on the press invitation, I didn't realize that I should have entered in another place and that in error I had entered by the celebrity entrance. Once there, I asked for permission to stay to watch the goings on. Once again I was struck by how natural and charming this brilliantly talented chef, performer, and cookbook writer is in person. Recently I found this photo that was taken on a polaroid camera and since I've become somewhat adept at scanning, I am now able to share it with you! I Adore This Dora Cake by Hector!